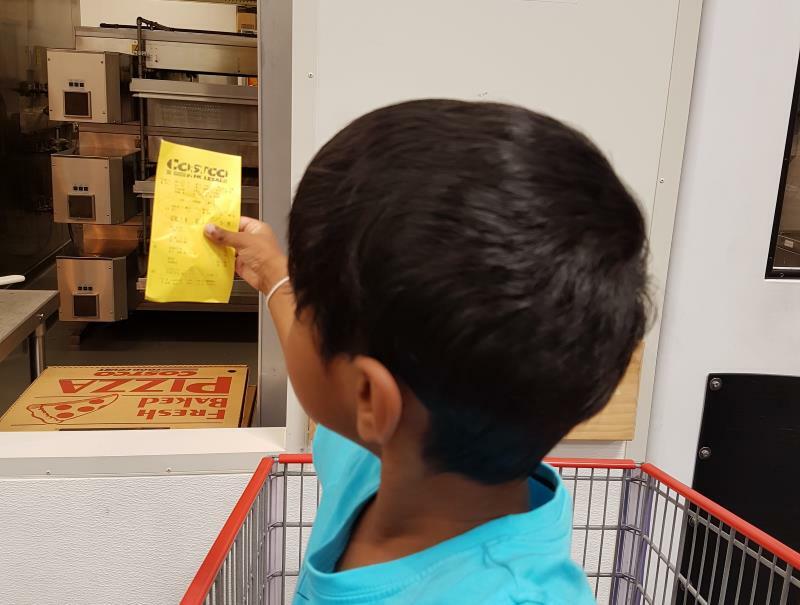 Last Sunday, we went for a driving lesson for my wife (her drive test is coming up shortly) and on the way we visited Costco to fill up the fuel tank and have pizza for lunch. The petrol (ULP 91) prices have hit 140c per litre everywhere, because of the high demand in the summer, yet as a Costco member, I could buy them at 118c, which was about 15% cheaper. We filled up the tank and came home. After I reversed the car in the car port at my apartment, I noticed a trail of liquid on the driveway leading to the carport. After a while, I noticed there was a bit of an oil spill under the car. It was a little spill, and I had to rush to a birthday party in the evening, so I went there and came back. I could notice more oil where I parked the car as well. Worried, I smoothly drove home (I drive smoothly anyways) which was only a 5 minutes away. I was watching for the low oil pressure warning whole through the trip back home, but it never came on. I never could feel or heard anything out of the ordinary from the engine either. 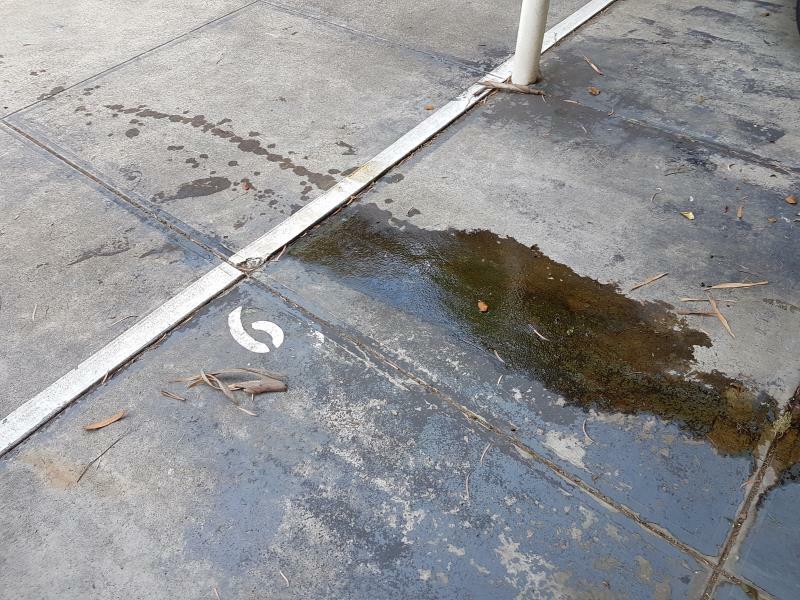 Once I parked the car, there was a new oil trail close (parallel) to the old one. So it was still leaking. I called my father and asked what I can do and he told me to check the oil level immediately even though I had driven the car few minutes earlier and even though it was not a perfectly flat surface. The carport floor ramps slightly forward. I saw NOTHING on the dipstick. NOTHING! I initially thought all of the engine oil had leaked out. The oil spill under the engine was much bigger now as well. So, I couldn't move the car. I talked to a mobile mechanic and he told me that there is a known issue with the Toyota Aurions prior to 2008 where the oil cooling hose which has a rubber midsection can get damaged over time and leak oil, and Toyota should replace it free of charge. I checked when Chadstone Toyota would be open and gave them a call at 7:30 in the morning, and made an appointment to bring the car for a checkup. I had a subscription to Budget Direct Roadside Assistance and I rang them up and asked them to tow the car down the Toyota. They took more than an hour to get to my place though. When they arrived, they quickly loaded the car up (they have to start the engine) and I went with them to Toyota. I left the car with them, and called few times to hear about it. They initially told me that they were busy with the service appointments and could only check the car ones they were done for the day. Towards the end of the day, I received a call telling me that the rear VVT-I line had a damage and the oil was leaking from it. Sadly, we had to pay to fix it and it wasn't cheap. $520. Much of it is the labour cost, which is crazy high for dealerships as I heard. I did research on the matter, and several people have had the exact same thing happened to them, and they told me I would have to pay about $500-600 to get it fixed. They were spot on with the cost. 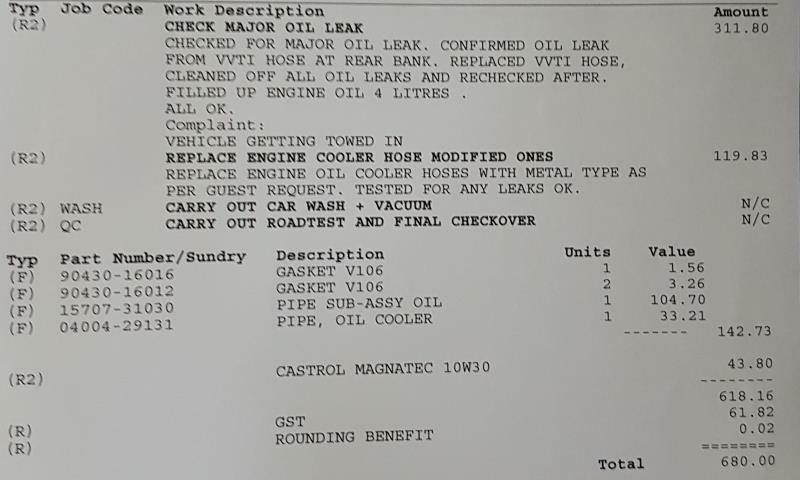 If it was the oil cooling hose, then as far as I know, they would have replaced it free of charge. I told them to replace the oil cooler hose with the all metal one as well, because one guy was saying he had his VVT-I line and oil cooling hose burst within a gap of a month!!! I didn't want to go through this again. Sadly for me though, they would replace it free of charge only if it broke. They seem to have a 'if it ain't broken, don't fix it' policy in place. So, the full cost of the repair/replacement/modification was $680. Yikes! That's almost the price of a GTX 1080. On Tuesday morning when I checked with them, they said they were waiting for the parts from wherever they bring them in. They had the all metal oil cooler hose in stock but not the VVT-I hose. On Tuesday evening, when I checked back with them, they said the repairs were done, and they had to do a road test the following day and I should be able to take the car back on Wednesday. At 12 noon on Wednesday, I received a text message saying the car was ready for pickup. I took an extended lunch break from work and went there by bus. I paid from the debit card (I don't have a credit card in Australia yet) and collected the car. They told me that they had to top up 4 litres of engine oil, so at least it was NOT empty when I checked the other day. It probably didn't show anything because of the slope. I drove for a bit and parked the car and let it settle. Then pulled out the dipstick and checked the oil levels. It was showing oil levels exceeding the high mark. I also checked if oil was leaking but it didn't appear to be so. I had an errand to do and quickly came back to work. When I came back to the car after work, I checked if there was an oil spill under the car and to my relief, there wasn't any. I know if something goes wrong with the repairs Toyota did, they have to fix it because of the 12 month warranty. But the thing is, tomorrow is Australia Day which is a holiday and Friday we have an important thing to do which needs the car. Friday is also a holiday at work because everybody wanted the 4-day long weekend. I understand these things happen, but now I will be wary for a while. Then you will forget it until a similar incident happens. I probably should have bought the car with an extended warranty, and I will probably do that the next time. I'm just glad we weren't stranded in nowhere with a broken car!